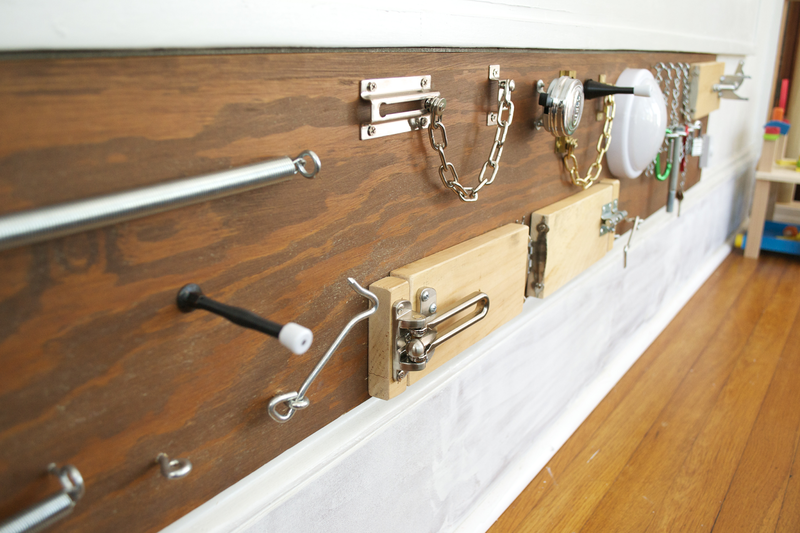 Will loves to mess around with various locks around the house and he loves the hardware isle at Lowe's so I've been wanting to make him an activity board for awhile. 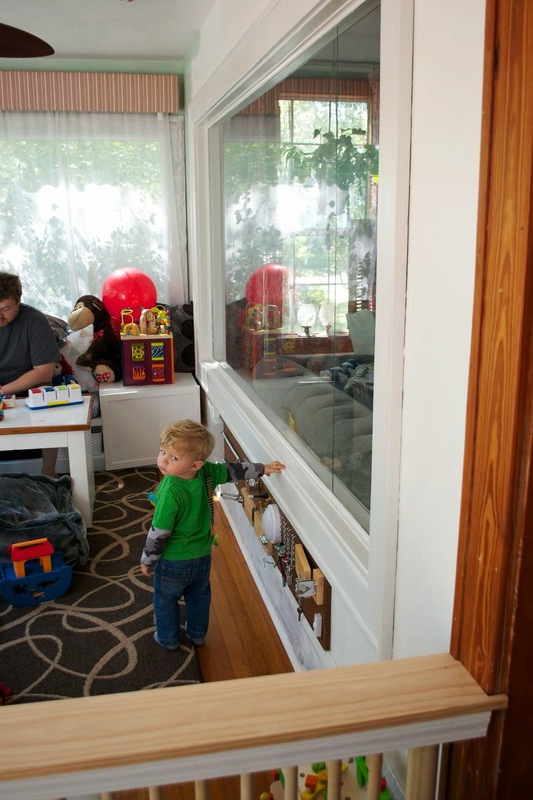 The main problem with that idea is that you generally need a good amount of wall space and with Will's playroom having windows on all three walls, there is very little, if any usable wall space. Luck would have it that once I actually took some measurements, that the space between the base of the interior huge window and the baseboards was exactly the width of a 1x10 piece of wood. And as greater luck would have it, we already had a stained 1x10 hanging out in the garage. Since neither Nate and I knew where it came from, it was deemed the perfect board for an activity center. 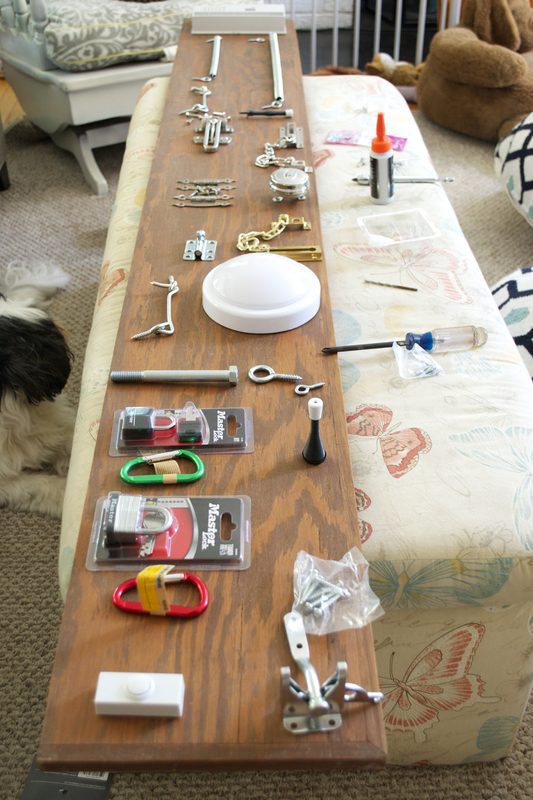 We raided our garage and went through Lowe's picking out various locks, latches, springs and bells that we thought Will would have fun playing with and went to work arranging them on the board. Some things got returned and other things were bought, but after some arranging and rearranging, we had a pretty good layout. 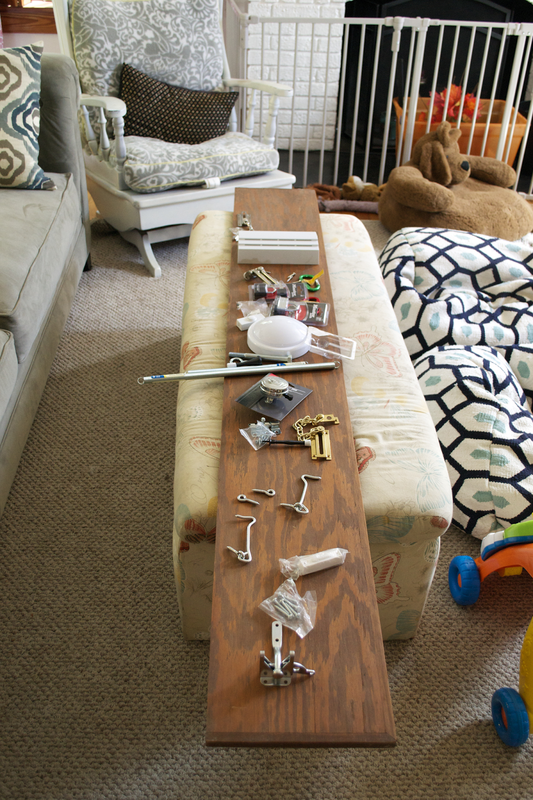 Installing and attaching everything proved to be more time consuming than we initially hoped, and I did mistakenly drill into the top of my ottoman (and snapped a drill bit in the process... ) but in the end we had a pretty awesome board for our little guy. 2 Long Springs: We attached these using eye hooks on both ends so Will can pull on them and they vibrate. I was initially worried about his fingers getting pinched but after some through testing playing, we determined that he couldn't get them pinched. 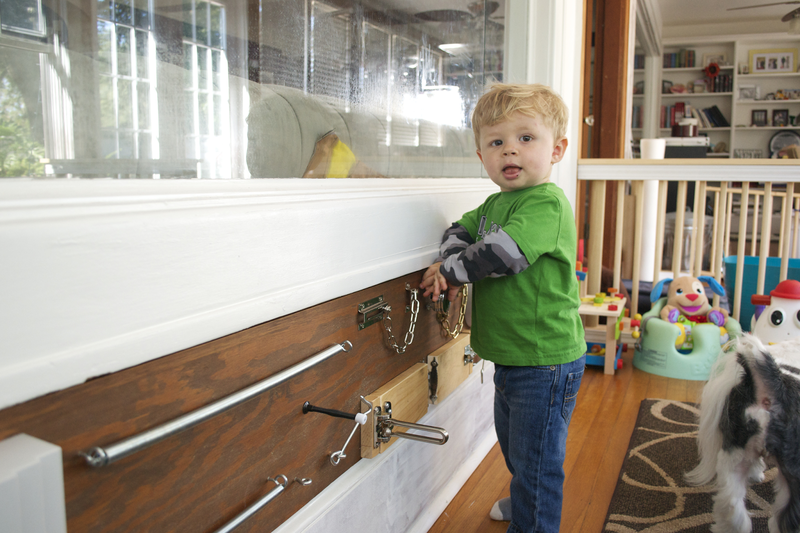 2 Chain Locks: We mounted one so that the lock slides horizontally and the other vertically so he has a bit of a challenge as he grows. 2 Spring door stops: One is a stiff spring and one is looser but the both boing really well and Will thinks they are pretty awesome... what kid doesn't love these? 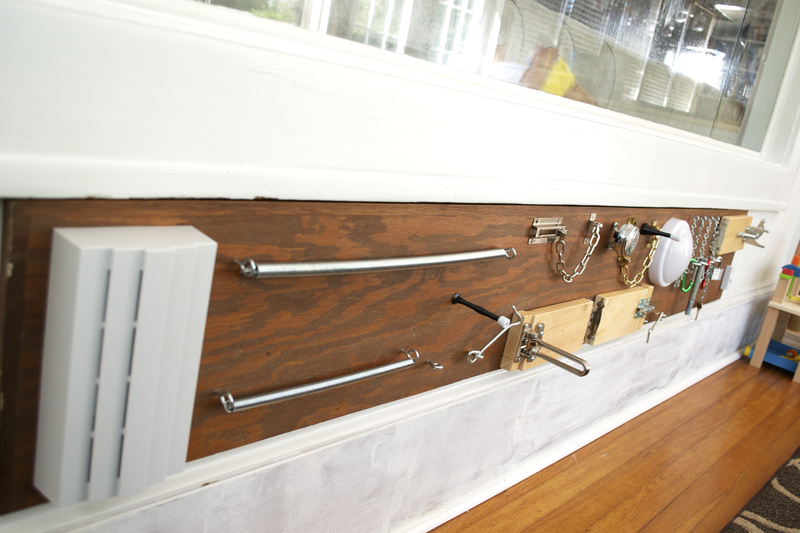 3 door latches with swinging doors: One is a security latch, one is a barrel bolt and one is a gate latch and we mounted them on scrap wood that Nate sanded down to create doors. 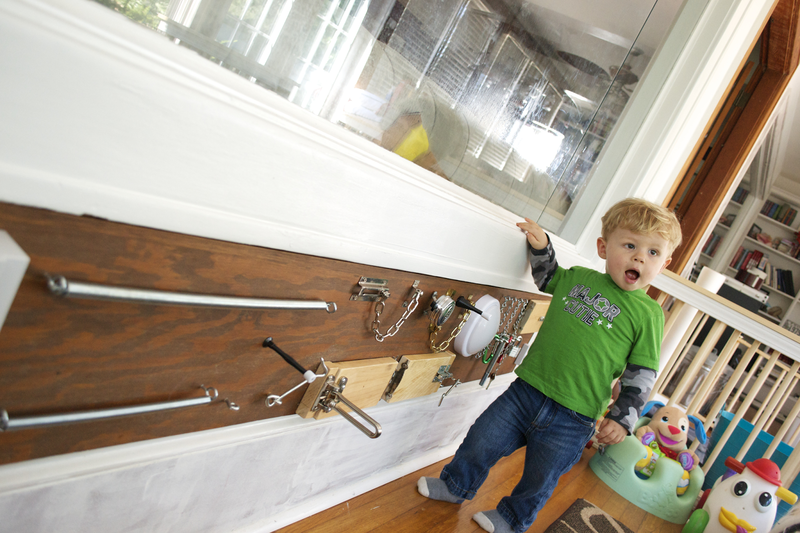 We are planning on mounting pictures behind the doors soon but for now Will seems to just like the fact that he can open and close the doors. Bicycle bell: this is a BIG hit. The bell we got is designed to go around a bike handle but after a little creative thinking, we got it attached to the board. It has a little lever on the side of the bell that Will can pull down on and it makes a not so annoying ring sound. Push Light: initially I wanted to try to get an actual light switch with a light but the push light was a safer. Will loves turning it on using his foot. 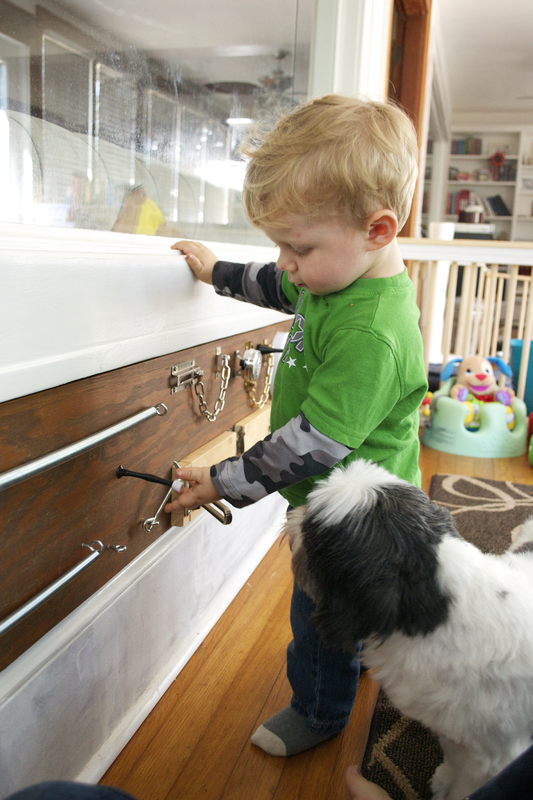 2 carabiners on chains: We installed large eye hooks near them so he can clip the carabiners on to them. For all the items on chains, Nate used our new (to us) drill press to drill holes so we could attach the chain and Will can't detach them. We made a point to not let anything be detachable on the board so things don't get lost. 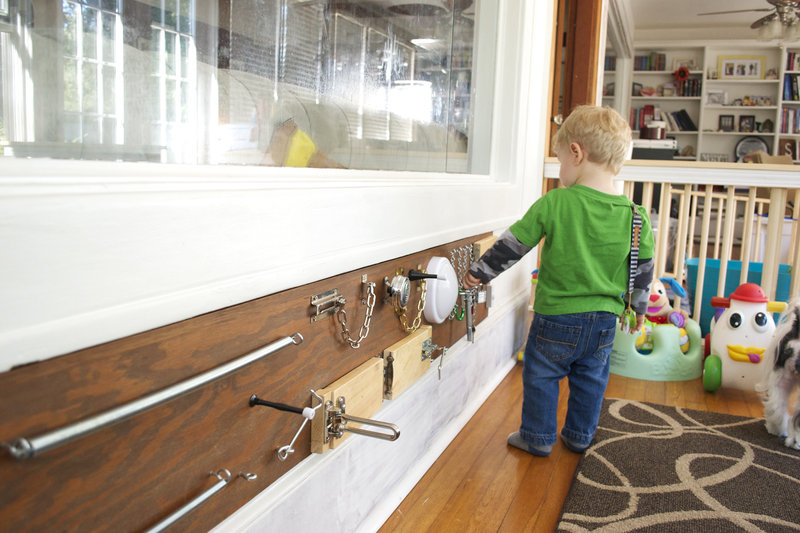 Some of the latches are a little too advanced for Will right now but we love the fact that he can grow into this board and use it for the next few years. Will is so darn cute, and I love, love, love this project for him! I saw this on MRL... and loved it! I know Will loves it too.